of the email. Upon receipt, your email address will be promptly deleted. We look forward to receiving your script. $5.00 – No Food. No RSVP. Coming from the north or south on I-10, take the St. Marys/Speedway exit. Go East to Granada St. traffic light. Turn right on Granada. 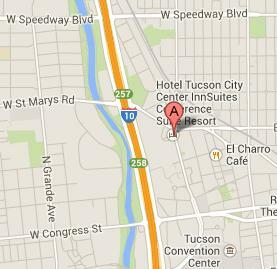 Second driveway is the Hotel Tucson. OR traveling west on Speedway, cross Stone Ave. Next left is Main St. Turn left, cross RR tracks. Go straight. Main becomes Granada at traffic light, and second right driveway is the Hotel Tucson. An inexpensive, simple, effective and grossly underused option to a dangerous verbal agreement or legal disaster. **SSA is changing up our meeting and our format. Our format will alternate as follows: Workshop on the 3rd Saturday, of October (cost of $5 no lunch. No RSVP needed. Sunday, November 19th regular Forum. Contest Winners will be announced and feted. RSVP needed. Cost $25. All workshops will be on Saturdays. All Forums will be on Sundays. Now in its fourth year, the prize celebrates the enduring significance of poetry to cultures everywhere in the world. It marks the University of Canberra’s commitment to creativity and imagination. Prize entries may be submitted until 30 June 2017. The winner will receive AUD$15,000. The runner-up (second-placed poem) will receive AUD$5,000. All poems entered for the prize must be single poems that have a maximum length of 50 lines. Each entry of a poem costs AUD$20. The Society of Southwestern Authors- May 21, 2017 ForumThelma Rea Presents Do You Like to Laugh? Thelma presents her own answer to a life do-over with humor and a bit of snark as she discusses her memoir humor A review of this appeared in the Phoenix City Sun-Times. She and her husband purchased 9 run-down cottages in the Ozarks of Missouri for their life changing adventure-and survived. How she then turned this into her published memoir. The National Writers Union will be hosting a reading and open mic on Monday, May 15, starting at 6:00 p.m. at 877 S. Alvernon Way. This month Jeanne Burrows-Johnson will be the featured reader. Jeanne will share some thoughts on the theme of “The Author Recycles: New Creations from Old Work.” Drawing from her background in business, education, and the performing arts, Jeanne will examine how elements of a writer’s fiction and non-fiction can be reshaped into new material for publication via print, Internet, and broadcast venues. She is the author of Prospect For Murder, the first title in a mystery series featuring the rich environs and multi-cultural history of Hawai`i. Jeanne is a graduate of the University of Hawaiʻi and a member of: Phi Beta Kapa, Phi Alpha Theta, The National Writers Union, Sisters in Crime, and Arizona Mystery Writers. The event will be held in our temporary location, the AFSCME/SEIU Union Hall at 877 S. Alvernon Way in Tucson. The building is on the east side of the street (opposite the Randolph Park golf range) and is a couple of blocks north of 22nd Street. There is ample parking. The room is on the first floor and we will have signs up to point the way.